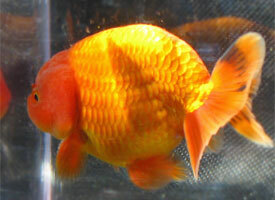 The ranchu is similar to the lionhead but has a much more curved posterior dorsal contour, making an acute angle of join (less than 90 degrees) with the upper lobe of the tail fin at the caudal peduncle, whereas in the lionhead the dorsal contour is flatter and the angle of join is obtuse (more than 90 degrees); also, the ranchu tail is splayed sideways with the lower lobes sometimes lying almost horizontal, whereas the lionhead tail is like that of the pompon, celestial and bubble eye. 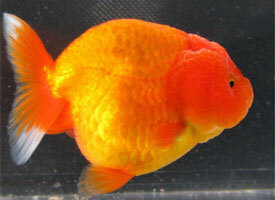 Calico ranchus seem to be favoured over self-coloured fish, whereas more metallic (particularly red) lionheads are seen than calico. 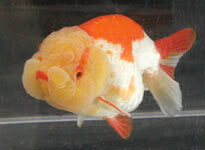 The ranchu was developed in China and imported and further developed in Japan. 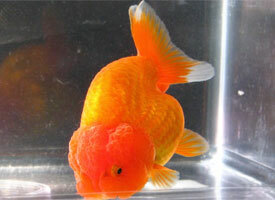 Ranchu are also known in the Far East as buffalo-heads. 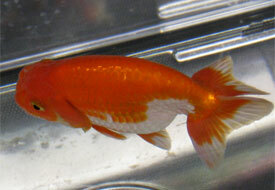 Calico ranchu are known as edonishiki in Japan. Hood well to be developed. Minimum body length 5.5cm (2¼ inches). The fish should be bright and alert. 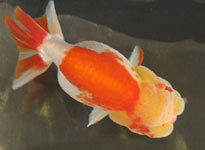 The body should be medium length with smooth contours and no sign of a dorsal fin. The caudal fin should be well divided, forked and held slightly above the horizontal. The hood should be well developed in all three areas i.e. 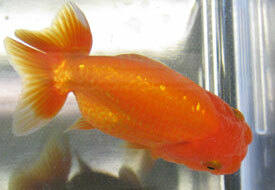 cranial, infra-orbital, and opercular (see "Finnage and body plan" on our goldfish information page). 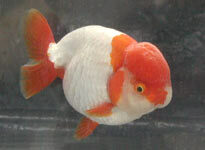 Red metallic ranchu shown at BAS 2011. 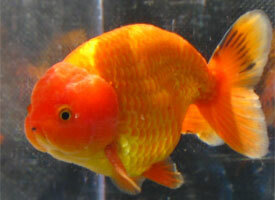 The top fish has a very deep body contour. Top views of two ranchu photographed at GSGB 2011. The hoods should develop further with maturity. 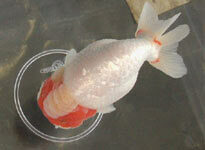 These fish were shown at BAS 2002; all three are red-white variegated, the fish on the right having a yellow head. 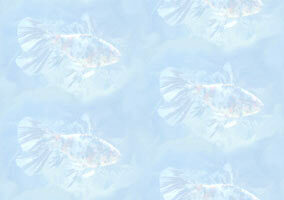 These fish were photographed in Hong Kong in December 2000 (left) and at BAS 2000 (right).